PAC DONATIONS ARE STILL BEING ACCEPTED! With the success of our 2016 election headquarters, we opened a headquarters for the 2018 mid-term elections. We are proud to say we helped get Donald Trump elected as president of the United States despite living in a “blue” state. In 2016, SMRWF's HQ made a significant contribution to President Trump's election victory. Using the phone system from the Trump campaign, we made almost 60,000 calls to swing states such as Florida, Ohio, and Michigan, to name a few. After the election, campaign officials told us calls originating from California, including ours, made the difference for his campaign. we also worked for local candidates such as Steve Fazio for state senate and Ken Wright for Congress. 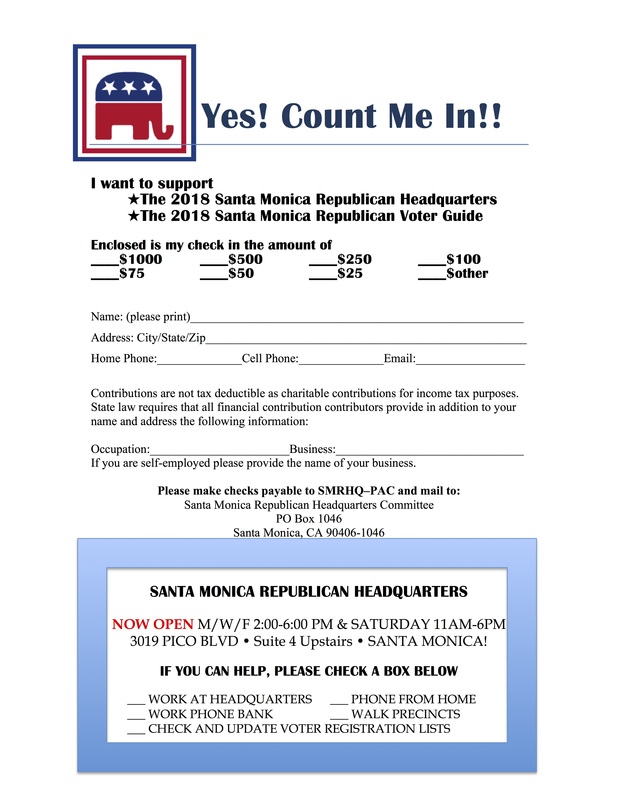 Thanks to your generous support of our headquarters in past years, we also published & mailed the 2016 election voter guide to all Santa Monica Republican households. 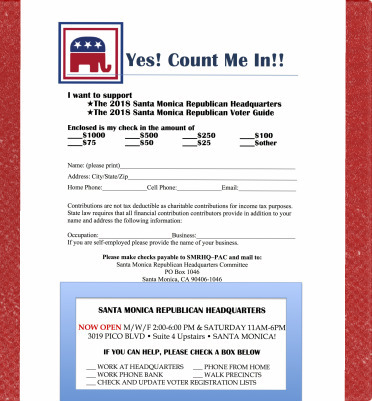 We need your help again this year to fund a campaign HQ so we can elect John Cox as California’s governor and Dr. Kenneth Wright to Congress, as well as all our other excellent Republican candidates for statewide offices and the legislature. Many of you have already told us that you would like to support the headquarters again this year. As always winning in November requires both volunteer hours and financial support, so now we are asking our fellow Republicans sign up as volunteers again this year. To volunteer, please call or email Headquarters’ Director Iris Jue, 310-503-2013, SMRWF1@gmail.com. Saturdays from 11:00 AM – 6:00 PM. SMRWF HQ • 3019 Pico Blvd. upstairs in Suite #4 • Santa Monica 90405. The entire SMRWF Board of Directors looks forward to working with you this fall!